Disclaimer: As a Gone for a Run Ambassador, I received a complimentary virtual race entry. I am not being compensated financially. As always, all opinions are my own. As we get closer and closer to the end of summer, and the heat and humidity continue to be higher than in previous weeks, I find myself turning more and more towards external sources of motivation in order to keep up with my training. Many times, that’s all of you, but sometimes, my motivation is races. The next race in the Gone for a Run Virtual Race Series is the Sole Sister Run Virtual 7 Mile Race, which will take place from August 28th-30th, which is also the weekend before my next half marathon. I’ve loved being able to participate in other Gone for a Run virtual races this summer, and I can’t wait to be able to close out summer and finish my half marathon training with a virtual race. What is included in the $32 registration fee? 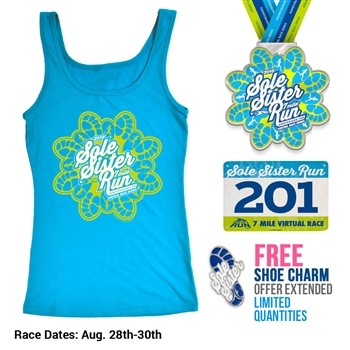 So who wants to join their other Sole Sisters for this virtual race? Be sure to register by August 18th in order to receive your race packet in time. QOTD: How do you stay motivated to train in the heat and humidity? This entry was posted in Races and tagged Gone for a Run, Sole Sister Virtual 7 Mile Race, virtual race. Bookmark the permalink. 28 Responses to Calling All Sole Sisters! Yes, the Gone for a Run registration prices are very reasonable, especially considering all the great swag that you get. I’m trying to understand the ”Gone for A Run” site. Is it just a shop to buy running and race paraphernalia? Also the Sole Sister Run just in one are or many states? I can’t run it but would walk it. That’s exactly what Gone for a Run is. And the point of a virtual race is that you can run the race anywhere, but you have the virtual community of other participants to support you and you get to support them. Its a lot of fun! Love their races!!! I’m super excited about this one!!! How do the virtual races log completion? Do you upload a file to Strava or MapMyRun or Garmin? Or you just get the swag and do it “on your honor”? Sounds interesting. Rapha does some virtual women’s rides through Strava so you can participate and also view how you’ve done versus others completing the challenge – there is also swag involved. Its an on your honor thing, though you’re encouraged to post pics to the Gone for a Run Facebook page. Ooh… I love that the shoe charm is one of the swag options! I’ve never seen that before. Right now, my best motivation has been running with friends since that makes it fun in spite of the heat and humidity. Running with friends is always fun! Wow. That seems like a lot of swag for the price! I’ve never done a virtual race but now that I am transitioning into running season from triathlon I’ll check into them as an option to keep things interesting. Yes, it definitely a lot of great swag for the price. I’m excited to do this one too! They have so many fun races. Love the shoe charm! Virtual races are so great – I love the medal and shoe charm! They’ve really raised the bar on virtual swag. I stay motivated over the summer by having a big fat marathon waiting for me in October. Being registered for a race always helps me to stay motivated too. 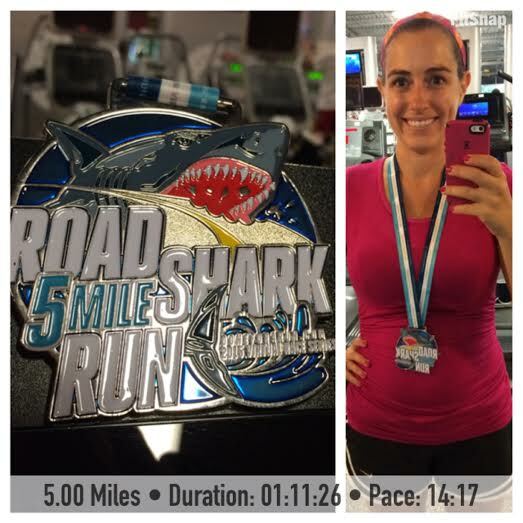 Love the shark medal!!! I haven’t done a virtual race before – I registered for one and then never got anything sent to me. The company was really good about it and refunded my entry fee, but it has made me hesitant to register for another. Getting some sun is always a great motivator for getting outside. I love the swag on this one, super cute!! Oh yes I love the shirt! I may have to sign up for this!